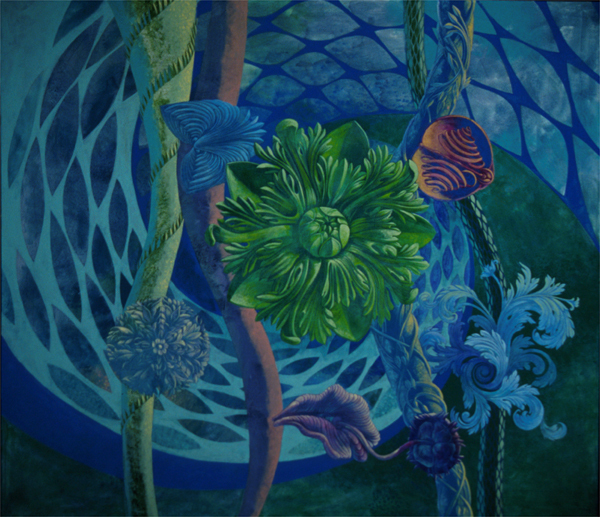 Garden of Proteus, an acrylic painting created by Steve Lotz in 2005. Lotz received his Bachelor of Fine Arts from the University of California, Los Angeles and his Master of Fine Arts from the University of Florida in Gainesville, Florida. Lotz became an instructor of art at the Florida Technological University (present-day University of Central Florida) in Orlando in 1968, and served as the chairman of the Art Department for its first 10 years. He retired as a Professor Emeritus in 2003. As head of the department, Lotz was integral in establishing the success of the University’s visual arts programs. Original 70.5 x 80 inch acrylic painting: Lotz, Steve. 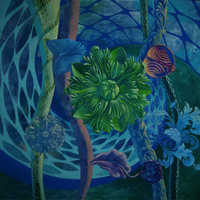 Garden of Proteus, 2005: Private Collection of Steve Lotz. Digital reproduction of original 70.5 x 80 inch acrylic painting: Lotz, Steve. Garden of Proteus, 2005. Orlando Museum of Art, Orlando, Florida. Lotz, Steve. “Garden of Proteus by Steve Lotz.” RICHES of Central Florida accessed April 23, 2019, https://richesmi.cah.ucf.edu/omeka/items/show/5397.